Lens: You can mount a wide range of lenses on your D3400, but some aren’t compatible with all camera features. For example, to enjoy autofocusing, you need an AF-P or AF-S lens. (The 18-55mm lens sold in a kit with the D3400 body is an AF-P lens.) Your camera manual offers details about lens compatibility. The AF in AF-S and AF-P stands for autofocus. The S in AF-S stands for a silent wave focusing motor; the P refers to an autofocusing technology known as a “stepping motor.” Both are designed to deliver faster and quieter autofocusing. How you implement autofocusing differs between the two types, however. SD (Secure Digital) memory card: Your camera accepts only this type of card. A card with the simple SD designation is an older, lower capacity card that holds a maximum of 4GB of data. Newer SD cards carry the designation SDHC (for High Capacity) or SDXC (for eXtended Capacity), depending on how many gigabytes (GB) of data they hold. SDHC cards hold from 4GB to 32GB of data; the SDXC moniker is assigned to cards with capacities greater than 32GB. Install the battery into the compartment on the bottom of the camera. First, remove the caps that cover the front of the camera and the back of the lens. Then align the mounting index (white dot) on the lens with the one on the camera body, as shown here. After placing the lens on the camera mount, rotate the lens toward the shutter-button side of the camera. You should feel a solid click as the lens locks into place. Align the white dot on the lens with the one on the camera body. 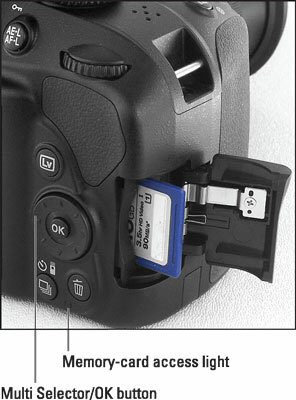 Open the card-slot cover on the right side of the camera and orient the card, as shown. (The label faces the back of the camera.) Push the card gently into the slot and close the cover. The memory-card access light, labeled in the figure, illuminates briefly to let you know that the camera recognizes the card. Insert the memory card with the label facing the back of the camera. If using a retractable lens, unlock and extend the lens. The lens barrels of AF-P kit lenses, as well as some AF-S lenses, extend and retract. When you’re not shooting, you can retract the lens so that it takes up less space in your camera bag. But before you can take a picture or even access most camera menu items, you must unlock and extend the lens. A message appears on the camera monitor to remind you of this step. 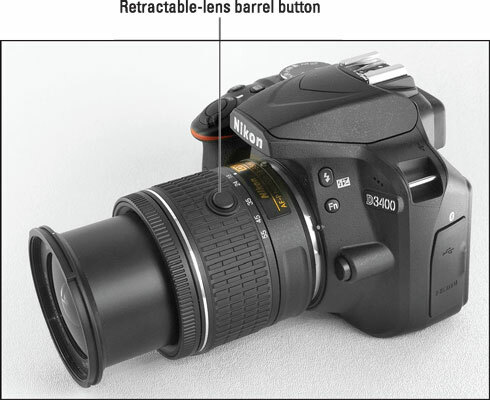 To extend the lens, press the retractable-lens barrel button, highlighted here, while rotating the lens barrel toward the shutter-button side of the camera. To retract the lens, press the button while rotating the lens in the other direction. 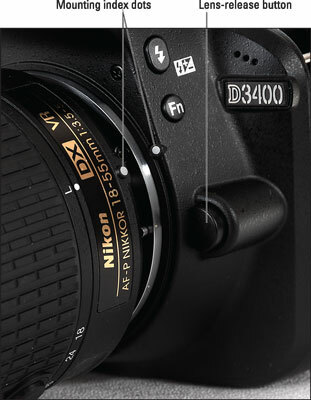 Press this button while rotating the lens barrel to extend and retract the lens. Set the camera language, time zone, date, and time. Press the edge of the Multi Selector up and down to move the highlight cursor vertically; press right/left to travel horizontally. Press OK or press the Multi Selector right to reveal options related to the highlighted setting. When a value box is highlighted, press the Multi Selector up/down to change the value. Press left/right to jump to the next value box. After making your selections on a screen, press OK. The date/time information is included as metadata (hidden data) in the picture file. You can view metadata in some playback display modes and in certain photo programs, including Nikon ViewNX-i and Nikon Capture NX-D. Adjust the viewfinder to your eyesight. Tucked behind the right side of the rubber eyepiece that surrounds the viewfinder is a dial that enables you to adjust the viewfinder focus to accommodate your eyesight. This step is critical: If you don’t adjust the viewfinder to your eyesight, subjects may appear sharp in the viewfinder when they aren’t actually in focus, and vice versa. To set the viewfinder focus, remove the lens cap, look through the viewfinder, and then press the shutter button halfway to display data at the bottom of the viewfinder. (In dim lighting, the flash may pop up; ignore it for now and close the unit after you adjust the viewfinder.) Now rotate the dial until the data appears sharpest. 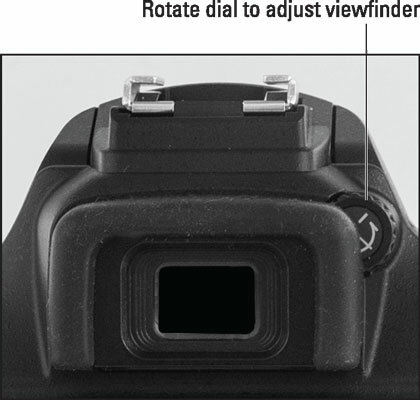 The markings in the center of the viewfinder, which relate to autofocusing, also become more or less sharp. Rotate this dial to set the viewfinder focus for your eyesight. That’s all there is to it — the camera is now ready to go.